Loro Piana Expands Canadian Presence with Concessions: Italian luxury brand Loro Piana has launched a retail expansion into Canada that includes concessions and as well as an upgraded wholesale presence. Standalone Loro Piana boutiques could be next for Canada, but the brand is first testing the waters with concessions at Holt Renfrew. On Saturday, November 11, Loro Piana opened a women’s boutique on the ground floor of Holt Renfrew at 50 Bloor Street. 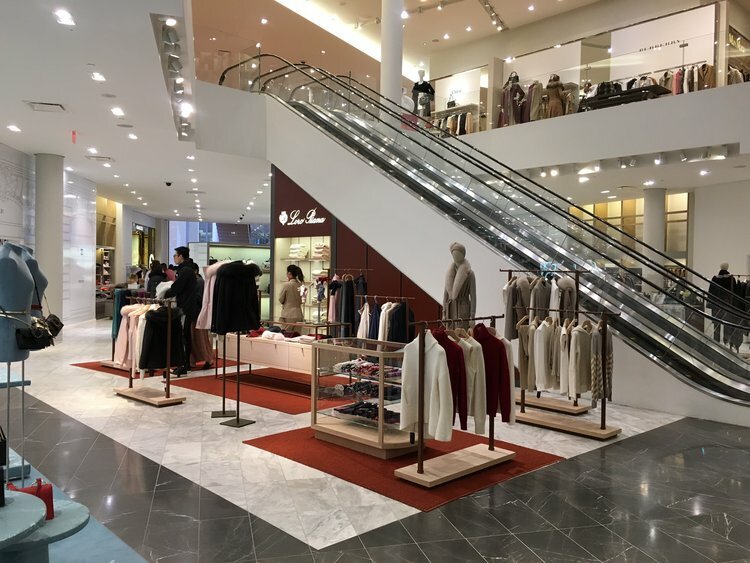 The week before, Loro Piana opened a concession at Holt Renfrew in Vancouver (which the company confirms is about twice the size of the Bloor Street shop-in-store), and a Yorkdale Shopping Centre Loro Piana concession opened earlier this fall, its first for Canada. Calgary’s Holt Renfrew will be the next to get a Loro Piana boutique when it opens next month. The Holt Renfrew concessions carry a range of Loro Piana women’s ready-to-wear and accessories, in attractive branded environments. Loro Piana is also growing its wholesale presence in Canada - menswear chain Harry Rosen is one of Loro Piana’s top accounts, according to a representative. Last month, for example, Rosen’s unveiled a men’s Loro Piana boutique on its recently renovated second level, and the brand continues to expand its presence in luxury retailers nationally. While there are no immediate plans for standalone Loro Piana boutiques in Canada, sources confirm that the brand has many Canadian clients who buy Loro Piana internationally. Its latest retail expansion might keep some of those dollars at home with an expanded product assortment. Loro Piana has boutiques in many major US cities as well as globally. Inside Moose Knuckle’s First Store: Edgy Montreal-based outerwear and fashion brand Moose Knuckles has just opened its first flagship retail space in North America, and it’s unique in its design and offerings. The 2,750 square foot retail space, designed by award-winning Burdifilek, aims to capture “the brand’s ethos for community, freedom, authenticity and balls-to-the-wall attitude,” by providing a “concept of a modern rebellion that emerges in this global brand concept”, according to Moose Knuckles. Flooring is real wood tiles, a wall is clad in raw steel, and there’s a deerskin couch covered in vinyl — it was explained that it was a take on ‘grandma’s sofa’. Moose Knuckles will be hosting events and product launches in the space, which houses the brand’s fall/winter 2017 collection of outerwear and other fashions such as footwear, bags, feather- weight puffers, the Player’s Light—a new group of non-fur options for warmer climates. Burdifilek’s Diego Burdi and Paul Filek explained that the new store was designed to embody the Moose Knuckles brand, in a way not possible in a multi-brand retailer where Moose Knuckles might otherwise have a wholesale presence. As well, the Yorkdale concept is designed with an aesthetic that would fit in if the brand were to open stores in markets such as Paris, Milan or Tokyo, for example. The Yorkdale Moose Knuckles lease deal was negotiated by the broker team behind DWSV Remax Ultimate Realty Inc. — ‘DW’ is David Wedemire, and ‘SV’ is Stan Vyriotes, who are working in partnership with some of the world’s top retailers and restaurants. Prominent retail consultant Andrea Elliott of r2 retail sources acted as advisor for the store’s retail portfolio — Ms. Elliott has a skillset sought by retailers that are looking at hitting the ground running when they open new retail concepts. “Product is available globally today 24-7 online, so the store better be an incredible and differentiated experience of the brand. It shouldn’t look like a store but a place that makes you want to spend time, engage with others that love the brand, see the best product and have surprises happen while you are there,” said Ms. Elliott. We’ll be featuring Burdifilek’s Diego Burdi and Paul Filek in a separate article this month in Retail Insider. First Episode of Upstairs Amy: Walmart Canada has launched its first-ever scripted dramedy series called Upstairs Amy, in partnership with Interac and APEX Public Relations. The branded content series, available on Youtube, is described as “a modern comedy about millennial parents and the gap between who they are and who they want to be. What’s interesting is that some of the products in the series are shopable — for example, Hamilton Beach’s products are featured throughout, with links to Walmart Canada’s website. Episode 1 is above, and it’s about 4 minutes long. H&M going bigger in Vancouver: H&M continues to expand its Canadian operations, and last week it opened an expanded store at Park Royal in West Vancouver. The store spans an impressive 23,000 square feet. Vancouver will see even more H&M when its CF Pacific Centre store expands next year — watch for more details to follow. Delays at Dior: According to signage on the Mink Mile, Christian Dior's massive Toronto flagship won't open until near the end of 2018. It should be worth the wait though -- the two-level Dior store will be the largest in North America when it opens, spanning about 13,300 square feet with 3,117 square feet at street level and an additional 10,194 square feet upstairs. Dior opened in Chicago on Friday, and its two-level boutique is about 3,300 square feet over two levels. The Vancouver Dior flagship, which opened in the summer of 2015, is about 9,800 square feet over two levels at the Fairmont Hotel Vancouver. Toronto will be seeing two important luxury flagships open in November -- Chanel is preparing to open its 8,700 square foot Yorkville Avenue flagship this week, and Hermes will unveil its 12,000 square foot flagship at 100 Bloor St. West at the end of this month. CF Toronto Eaton Centre will host its official tree lighting ceremony on Thursday, November 16 with a special performance by Choir!Choir!Choir!. Much like last year, the tree will be a gigantic 100 feet tall — about the same height as a 10-storey building. Black Friday (November 24) at Dixie Outlet Mall: For its third year in a row, Mississauga’s Dixie Outlet Mall’ is bringing back the Cash Cube – a 6ft x 4ft interactive touch screen cube. Each hour, one lucky participant will unlock the Cash Cube to win a Dixie Outlet Mall gift card valued from $100 to $1,000. Total daily giveaway value is $6,000. Square One Partners with Swarovski: On Wednesday, November 15th, Swarovski will unveil its holiday tree at Mississauga’s Square One — it will be adorned in over 1,500 crystal ornaments to complement 14 tiers of crystals and as well, Swarovski will debut a globally-exclusive digital Sparkle Pop Up. We’re told it will be amazing, and we’ll follow up with some photos in our next Brief. Yorkdale Prepares for the Holidays with Gift and Parking Concierges, Fashion Santa, Ladurée and Dyson: Toronto’s Yorkdale Shopping Centre, which again is going to be Canada’s most productive mall according to Retail Council of Canada’s 2017 Shopping Centre Study, is launching new customer-centric initiatives, not to mention new retailers. Personal shoppers from Yorkdale’s Style Concierge are available for 10-minute walk-in consultations beginning on Black Friday (November 24th) and every weekend leading up to Christmas. For those seeking more, a personal shopper can be booked for $150 for a two-hour shopping trip (make an appointment at yorkdalestyle@outlook.com). There’s also a ‘bag valet service’ for those who have used valet parking — beginning November 20, you can bring parcels to the Guest Services kiosk located beside The Face Shop and a Guest Services Representative will have your parcels delivered to your vehicle. There’s also a ‘Parking Concierge’ — beginning on Black Friday and every weekend leading up to Christmas, Yorkdale’s Parking Concierges will greet vehicles as they enter the property and direct them to the lots with the greatest availability. Fashion Santa returns this year, played by edgy model Jack Foley — proceeds from donations go to SickKids Foundation. Also, December will see the opening of Toronto’s first Ladurée at Yorkdale, and Dyson will also be opening its first Canadian showpiece next month — Yorkdale is shaping up to be unlike any mall in North America with its unique first-to-market concepts.